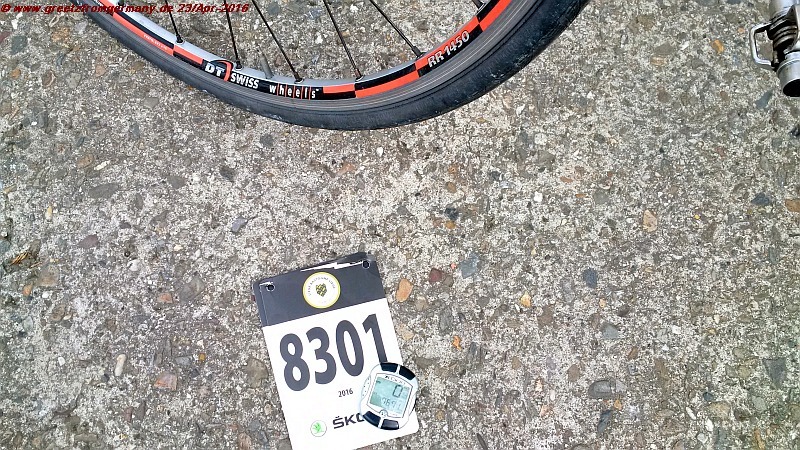 Yesterday, when arriving in Liège, the sun was shining – very much to the author’s relief: Not only was there some hope that the miserable weather forecasted for the day after – the day of the Liège-Bastogne-Liège ride – would be a bit more inviting than feared over the last few days; the really ugly city of Liège looked a little less shabby and run-down in the (temporarily) bright sun: Beaujour, Tristesse! As a first-timer to Liège, there was no clear expectation … but somehow a city like Antwerp or Brügge or Gent was in the back of the visual mind. Surely nothing like the bleak and neglected (often even completely uninhabitated) 1960s and 1970s concrete ghettos. Repulsive. Well, this trip was for riding out of Liège, so not to worry too much about the desolate starting point of what was expected to be a great (and greatly challenging) ride, with all its steep climbs of up to and more than 20% of inclines and the views that may look somehow familiar, as they have been seen through sports event film cameras many times before. The start to the day was not as great, however – with the promise of the previous day not fulfilled: rain and 5.5°C degrees at 7am, busting all excitement and motivation. Two hours later and uncountable opening and quick closing of the window later, it was still a difficult decision to take whether or not this ride would be worthwhile the price of probably freezing half-way to death and running the risk of having to navigate the climbs and horribly worn streets of Belgium (including some cobble-stoned ones) in the rain, adding a slick and slippery touch to what is a challenging tour even in dry weather. Good there was a window of two hours of time to start the ride. Although that meant that you had to go off to the course in a rather unspectacular, even: mirthless, way. – Beaujour, Tristesse! Those who don’t ride, though, will never find out about the price to pay – and whether it’s worthwhile. So, the decision was a positive one in the end. Apparently a lot of debating had gone on in other riders‘ minds as well – at least, there were still lots of riders in the starting area when the blogger arrived at 10am sharp, the minute which was the official end of the time window for the start. Nobody cared, though, and so off we went … with many more following suit in the minutes and potentially half hour later, still. Good! As this meant one less worry, namely having to ride more or less solo, over the course of 76km and more than 1,200 vertical meters. At least, there were lots of other riders giving the mind a pretext to go wandering every once in a while, forgetting about the body’s pains and cries for mercy – especially on the three Cotes that were to be ventured as time trial parts of the ride, giving it a bit of a racing event. 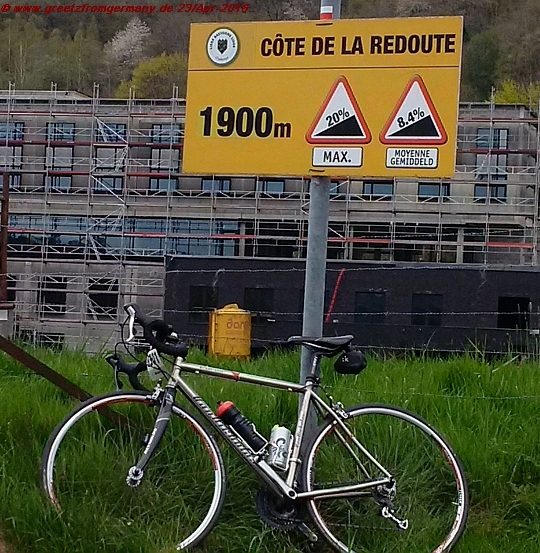 Cote de la Redoute is really as steep as rumor has it. According to the author’s GPS device, there were even short stretches of uphill road which briefly touched on the 23% and 24% mark of inclines. 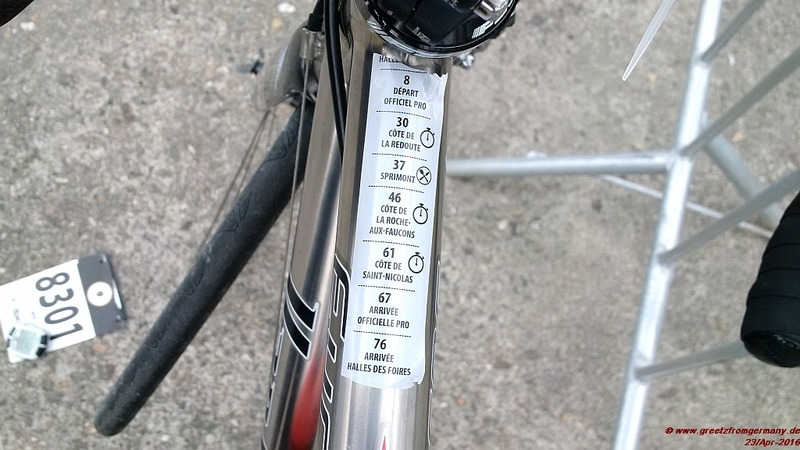 Then again, what does „racing“ mean, if one feverishly tries to simply keep going at a pace sufficient to prevent simple toppling off the bike (even to say „at a pace sufficiently fast to prevent falling over“ seems to give an impression of speed that wouldn’t be an adequate reflection of what truly happened). It was a painfully slow and wobbly climb up that first time trial „racing“ stretch, 2K uphill on what’s known as the Cote de la Redoute. It was a stretch good for revelation as well, as now there is proof that it is indeed possible for the author to stay on top of her bike on 20% inclines. But not on steeper ones. As of today, this has been proven: Beaujour, Tristesse! The next 100 or 150 meters were dedicated to pushing the bike (something one has the pros seen doing on this Cote as well, which is a tiny little bit of consolation in this state of personal riding disgrace). With the mind rushing, in the attempt to come up with a good technical solution for getting back on the bike without looking like a clown (or, worse, risking to add a spill to the disgrace of having walked). In the end, it all worked just fine – and the racing heart and lung needed less than one kilometer of downhill riding to return to something that could pass for „normal and adequate“. Especially since it now it wasn’t very far before there should be chance to fill up with some carbohydrates – the first ones of the day, as with all the early-morning inner monolog the author „forgot“ to eat something and, hence, worked her way to and over Cote de la Redoute on a cup of coffee and the burger dinner of the previous evening. But with a ride in Belgium, there are always waffles somewhere. Don’t be fooled: Cote de Saint-Nicolas is the last one that is counted towards the time trial results of the Liège-Bastogne-Liège challenge for everone. But it is, by far, not the last long and steep and draining stretch of road to be mastered. Two honey-filled and one sugar-coated waffle plus a slice of honey cake later, it felt like it may be doable, after all, to successfully attack the remaining two timed climbs (plus uncounted non-timed ones). 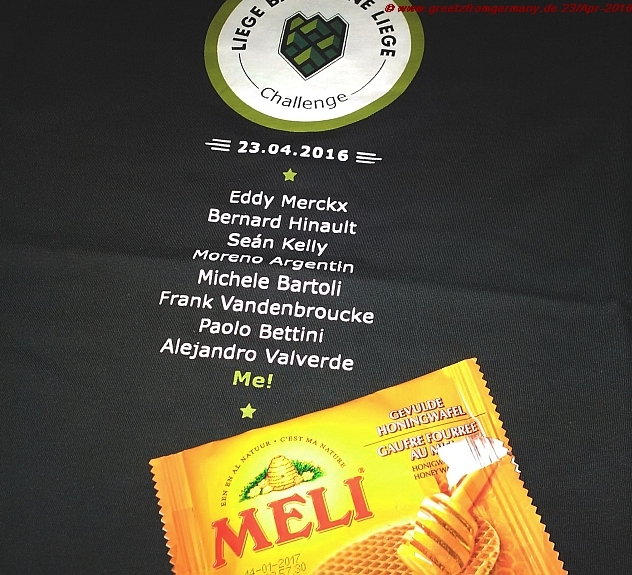 And it was – may honey-filled food products be blessed (or the firm believe in them, at least)! 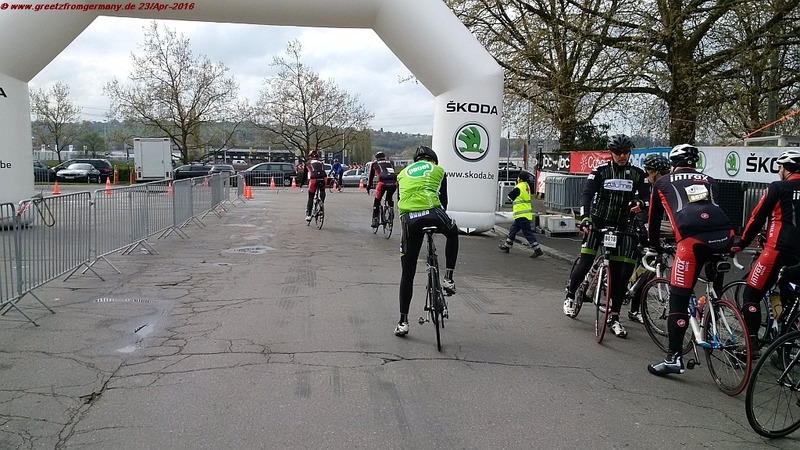 However, there was a pretty brutal awakening: After the Cote de Saint-Nicolas, there was still the official finish line of the pro race to be reached. And that meant: Yet another ca. 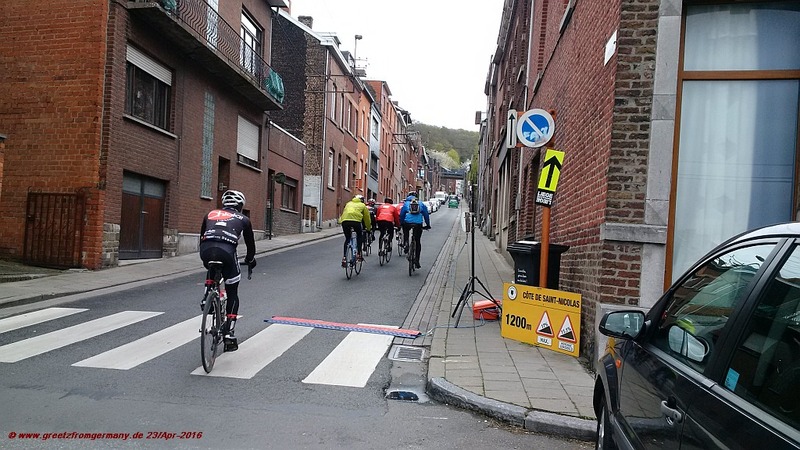 2K long incline which was measured as oscillating between 6% and 8% … and not a single curve to make it a little easier on the psyche; just this loooong and steep and ugly Liège city road. – Beaujour, Tristesse! In the end, there was an end to all of this – although it was nothing glorious or at least festive: Out of the sudden, the riders who dribble into sight of the Halles des Foires, find themselves rather abruptly stopped by some metal bars, guiding them to a handful of young folks who cut off your ride number and tell you to deem it in for a T-shirt or a money refund. And that’s it. End of race. Game over. – If you expect anything more celebrational, brace yourself, you may be a bit disappointed. Au revoir (or maybe not), Tristesse.